19th century museums were often combined art galleries, exhibitions of historic artifacts, zoological displays, dioramas of significant events, exhibitions of oddities, and musical performances. Vannuchi's Museum, formerly owned by the “king of clowns,” Dan Rice, displayed over 200 wax figures, many of which were set in motion by internal mechanisms. At Burnett & Prescott’s Museum and Zoological Institute, visitors watched Professor Charles Hudson, a Bohemian glass blower, give demonstrations of his art. Besides a variety of birds with brightly colored plumage the museum boasted a talking cockatoo, a happy family of opposite natured animals in one tenement, and a huge boa constrictor. Snake shows were very popular at the time. For those with more refined tastes, there also were paintings, dioramas, and panoramas frequently exhibited at the Armory Hall on Camp Street and at the Masonic Hall at the intersection of St. Charles and Perdido Streets. There are some wonderful descriptions of these exhibits in the journal of Thomas K. Wharton, published by the Historic New Orleans Collection as Queen of the South, New Orleans, 1853-1862. 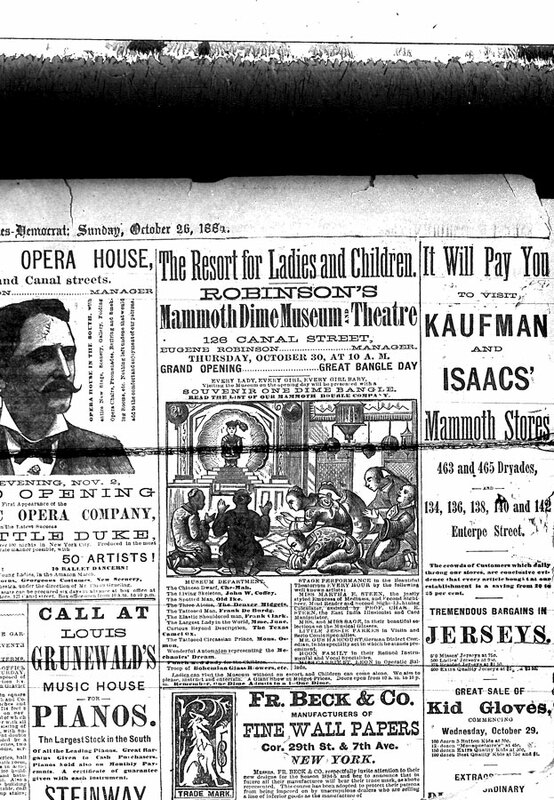 Thomas Wharton and his son were frequent visitors to many of the museums, circuses, and exhibit halls in New Orleans. Another side of the museum world involved private collectors who allowed the general public to view works. James Robb, a banking and railroad tycoon, was probably the biggest collector in mid-19th century New Orleans. He purchased many of his artworks from the sale of the Joseph Bonaparte collection in 1845. Following the financial panic of 1857, Robb was forced to sell his collection at auction. His mansion and part of his collections were sold to John Burnside, a wealthy Irishman. Unfortunately, Burnside was eventually unable to take care of the house and grounds. He allowed it to become dust-covered and rotten, until at the time of his death both his house and grounds had fallen into disrepair and its former beauty and glory were but a memory. The New Orleans Museum of Art now owns The Toilet of Psyche by Charles J. Natoire that was at one time in the collection of James Robb. The Robb house was demolished in 1954. Architect, Henry Krotzer saved pieces of a Dominique Canova fresco from the house and the fragments are now in the collection of the Louisiana State Museum. In Norman’s New Orleans and Environs 1845 Guide to the City, there is a description of what came to be known as the National Gallery of Paintings. “The principal object was to form a rallying point for the exhibition of the works of celebrated artist, both of foreign and American origin, and to dispose of such as might please the fancy of the public, at a certain fixed price.” The gallery was opened in 1844. There were a number of New Orleans artists represented in the National Gallery of Paintings and various art associations were founded through the years. These associations often had their own viewing galleries. The Art Union was formed around 1880 and a little later the Southern Artists’ League and Arts Association which eventually merged with the Arts and Exhibitions Club in the 1890s. Through these organizations, Isaac Delgado provided monies in 1910 to found a museum of art in City Park, which is today the New Orleans Museum of Art. The French Quarter Museum Association is a network of seven unique cultural and historical museums that tell diverse stories from all corners of our oldest neighborhood. These include the Beauregard-Keye House and Garden Museum, the Hermann-Grima and Gallier Historic Houses, The Historic New Orleans Collection, Louisiana State Museums which includes the Cabildo and the Presbytere in Jackson Square, The New Orleans Jazz Museum, The New Orleans Pharmacy Museum, and the Catholic Cultural Center, which includes St. Louis Cathedral and the Old Ursuline Convent. 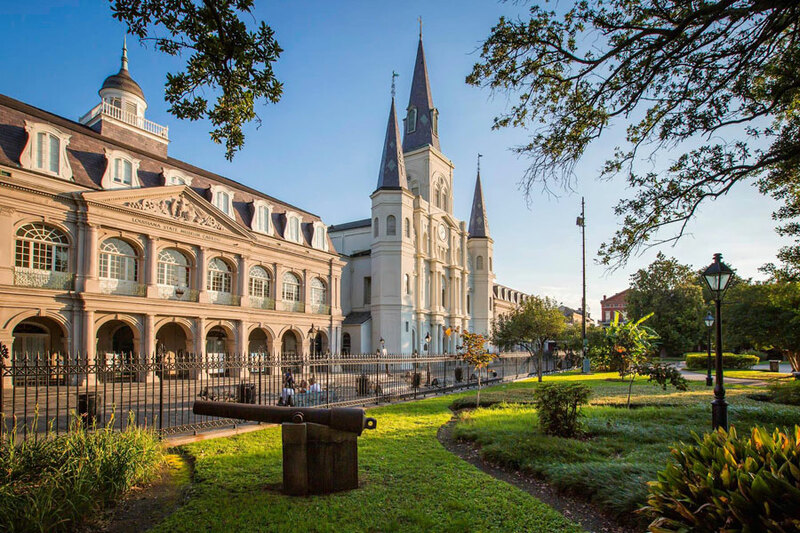 For information on these fascinating French Quarter museums, check out the French Quarter Museum Association at frenchquartermuseums.com or call (504) 598-7149. Mardi Gras is one of the major attractions and cultural touchstones of New Orleans. The Mardi Gras Museum of Costumes and Culture lets visitors explore the rich history of the annual celebration through the elaborately designed costumes. From the regalia of the kings and queens to the feathered and beaded looks of the Indians, the vibrant creativity of the event is on full display. The interactive costume closet lets visitors try on a piece of history and snap pictures to share and remember. Open Monday through Saturday, 10am to 5pm. 1010 Conti Street, (504) 218-4872. Offering a compelling blend of sweeping narrative and poignant personal detail, The National WWII Museum features immersive exhibits, multimedia experiences, and an expansive collection of artifacts and first-person oral histories, taking visitors inside the story of the war that changed the world. Beyond the galleries, the Museum's online collections, virtual field trips, webinars, educational travel programs, and renowned International Conference on World War II offer patrons new ways to connect to history and honor the generation that sacrificed so much to secure our freedom. 945 Magazine Street, (504) 528-1944. New Orleans Museum of Art (NOMA) is New Orleans’ oldest fine arts institution, opened in 1911 with only nine works of art. Today, the museum hosts an impressive permanent collection of almost 40,000 objects. The collection, noted for its extraordinary strength in French and American art, photography, glass, and African and Japanese works, continues to expand and grow, making NOMA one of the top art museums in the south. The five-acre Sydney and Walda Besthoff Sculpture Garden at NOMA is one of the most important sculpture installations in the United States, with over sixty sculptures situated on a beautifully landscaped site amongst meandering footpaths, reflecting lagoons, Spanish moss-laden 200-year-old live oaks, mature pines, magnolias, camellias, and pedestrian bridges. One Collins C. Diboll Circle in City Park, (504) 658-4100. Located in the vibrant Warehouse Arts District downtown, the Ogden Museum of Southern Art holds the largest and most comprehensive collection of Southern art and is recognized for its original exhibitions, public events and educational programs which examine the development of visual art alongside southern traditions of music, literature, and culinary heritage to provide a comprehensive story of the South. Established in 1999, the museum attracts diverse audiences with the mission of broadening the knowledge, understanding, interpretation and appreciation of the visual arts and culture of the American South. 925 Camp Street, (504) 539-9650. The Louisiana Children’s Museum is one of our premier attractions for children, engaging children, families, and school groups in memorable interactive experiences designed to make learning fun. The Museum’s 30,000 square feet of exhibit space and programs offer children a diverse set of activities that promote learning across many disciplines, from reading and math skills to architectural ideas and the nuances of grocery shopping, through interactive play. Whether they are learning what bones they use to ride a bike alongside Mr. Bones or loading up a cargo ship in the Little Port of New Orleans exhibit, children will enjoy taking an active role in their own learning in this delightful museum. 420 Julia Street, (504) 523-1357. New Orleans’ official cocktail, the Sazerac, will be opening a new museum, Sazerac House, a cocktail and liquor museum at 500 Canal Street. The Sazerac Company traces its history to the original Sazerac Coffee House, which opened in 1850. The family-owned company distills spirits including Buffalo Trace whiskey, Sazerac Rye and Southern Comfort and is one of the largest liquor brands in the United States. The 48,000-square-feet Sazerac House, inside a building that dates to the 1860s, will have a three-story museum on the history of cocktails. The museum is scheduled to open in October of 2018 and will be free to the public. “Our roots run deep here,” Kevin Richards, a senior marketing manager said. “We have a lot of archival assets, from really cool old bottles to old ads and artifacts. We think this can be an ode to cocktail history that can tell a really compelling story.” In addition to the Sazerac cocktail, influential brands in the company’s portfolio will be highlighted, including Herbsaint liqueur, Peychaud’s bitters and Ojen, a recently revived specialty spirit with a niche following in New Orleans. Southern Comfort, the global whiskey label the Sazerac Company acquired in 2016, will have a place in the museum, and so will vintage brands that are no longer in commerce but have ties to the company. The Sazerac Company traces its New Orleans history to 1850, though some of its products have even older connections. For instance, a pharmacist named Antoine Peychaud arrived in New Orleans from Haiti about 1830, began dispensing his namesake bitters, and created a product that is now a staple for bartenders worldwide. It's a key ingredient in the Sazerac cocktail. Cheers! Here’s to learning more about our historic city by visiting the many interesting museums that are offered. Have fun!